The oldest purpose-built public art gallery in England isn't in central London, but in the southeastern suburbs. 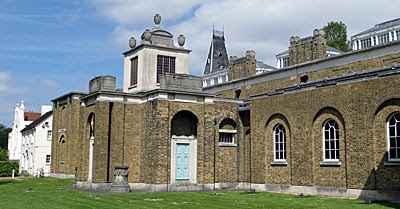 The Dulwich Picture Gallery was opened in 1817, the result of a posthumous bequest by a generous benefactor. It built on the collection of Edward Alleyn, 17th century founder of the public school nextdoor, and became famous for an important range of works by Western European painters. The gallery's architect was the redoubtable Sir John Soane, who built the place for £11270 'in a plain and substantial manner', ensuring a considerable amount of hanging space within its lofty walls. Several additional small galleries have been tacked on since, and the operation gained charitable independence from Dulwich College just 20 years ago. And if you like a bit of culture, and have a bit of cash, you should go. 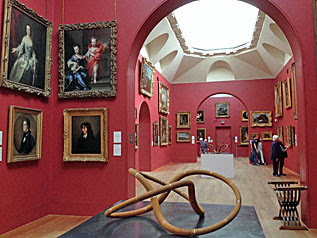 There are two bits to Dulwich Picture Gallery, the Permanent Collection and the special exhibition. Visiting the former costs a fiver, topped up by an optional donation of £1 (in that special slightly pleading way that many independent attractions now embrace). The special exhibition, at present a retrospective of the Sussex painter Eric Ravilious, costs £7.50 more. Mmm, Ravilious. The Permanent Collection fills the long central atrium and a trio of side galleries. Paintings are hung by nationality, with the Italians up one end and the Dutch at the other, the majority still in their original ornate golden frames. Don't come expecting modern abstract art, these are more your Old Masters, with an abundance of pastoral scenes, prim portraits and plump cherubs. And none the worse for that. I found the collection more interesting than your average National Gallery, perhaps due to its compact variety, aided and abetted by just the right amount of text alongside each of the works. You can learn a fair amount about Greek goddesses and windmill design if you pay attention, and learn which once-popular now-overlooked continental painters most inspired our English landscape tradition. You might have seen the DPG in the media recently thanks to a clever stunt, or intriguing project, whereby one of the works in the Permanent Collection was deliberately replaced by a fake. Visitors were invited to guess which of a hundred-or-so works it was, which proved surprisingly difficult, and the cuckoo in the nest was revealed only a few weeks ago. It's Fragonard's portrait of a Young Woman, the replica painting sourced from an artists’ workshop in China for a trifling fee. Now the two are hung together it's easy to spot the difference - the colours are too bright, the eyes too inexpressive and the background insufficiently complex. But only one in eight visitors over the previous few months spotted the impostor, which just goes to show whatever it just goes to show. Each weekend afternoon at 3pm a free guided tour takes place. Someone goes to fetch the member of staff with the loudest voice, and he rings a bell before inviting participants to assemble, and then a curator takes everyone round. This is no lightweight tour, the curator knows her stuff, targeting her favourite works and digging deep into their history and rationale. Equally her audience isn't always up to the challenge, sometimes failing to answer the most basic questions any History of Art student would know, even after the most blatant multiple choice hint. For other visitors not part of the slow-moving walkabout, it pays to keep one step ahead else the painting you're trying to look at is suddenly mobbed and you might as well come back later. I should have learned the same lesson regarding the Ravilious exhibition. When I arrived at the gallery the queue was non-existent, so I thought I'd do the rest of the rooms first, only for a sudden rush of pensioners to filter in as I drew close. I'll hang on a bit longer, I thought, but alas the queue got longer and longer, due (it turned out) to the arrival of a coachload of elderly visitors from the West Midlands. Ten minutes of standing around eventually got me to the front, where I was offered an audio guide for a bank-breaking extra £3, so no thanks. And I then spent the next half hour attempting to enjoy the very special paintings while they were only part-obscured by the milling Coventrians. Don't come mid-afternoon at the weekend, is I think what I'm saying. Eric Ravilious is famous for his watercolours, of which 80 are assembled here. He worked between the World Wars and into the Second, with a unique style honed in his native Sussex. Rolling landscapes were his thing, and interiors, and close-ups of boats, and even people as his career drew to a close. Chalk figures on hillsides became a particular favourite of his to paint, and also collections of trees either verdant or with sticklike branches. Outside of watercolours he was also an accomplished illustrator and designer, and one of his woodcuts still graces the cover of Wisden Cricketers' Almanack. Eric's talents earned him a place as a War Artist, following the Royal Navy across and occasionally beneath the ocean to record the realities of 20th century combat. It was on one such assignment in Iceland in 1942 that his plane disappeared without trace, and Britain lost his talents at the young age of 39. But you'd like his oeuvre, indeed the gallery are counting on you liking their fridge magnets, notecard wallet, teatowel and silk scarf too. And there's one more temporary exhibit to mention, this in the mausoleum where the gallery's founder and his wife are buried. Counterpoint is a lightwork by Conrad Shawcross, a twirling mechanical creation made of oak with four lightbulbs on stalks. Each marks out a particular geometric orbit which the artist has replicated for his latest intervention in neighbouring Dulwich Park, called Three Perpetual Chords. This trio of cast iron sculptures is meant to fill the void left by a sadly stolen Hepworth, and they sit on the lawns near the flowerbeds to the north of the lake. Of course, faced with three giant interlocking hoops what children really want to do is clamber all over them, so I hope Southwark council were expecting their sculpture commission to become a giant climbing frame. But then they do art properly in Dulwich, which is a damned fine reason to visit.